Leaking pipes, blocked drains, dripping faucets - we can fix them all! Plumbing problems are always frustrating as they always come unexpectedly. Coming home to a leaking pipeline or blocked drain is unpleasant but don't ignore the problem until it gets bigger! Fantastic Handyman can fix the problem for you. We work with multi-skilled and professional plumbers, which can perform a same-day service if they’re schedule allows it. Our technicians can help fix an unavoidable problem, whether is an appliance connecting, blocked drain, leaking pipelines or toilet installation. 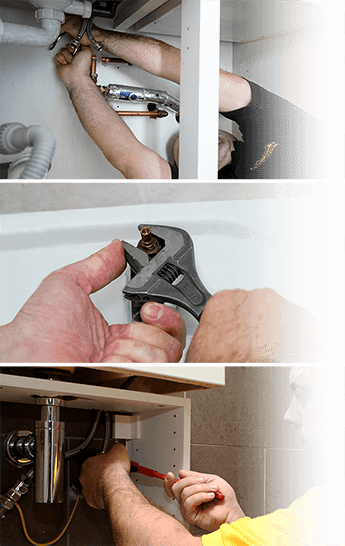 Plumbing installations: installing and connecting washing machines, sink fittings, shower and sink installation. No job is too small, too big or too complicated for the reliable plumbers. We make sure to specifically select every technician and provide them with regular training to achieve the highest industry-set standards. We make sure to provide excellent tools and equipment to our plumbers, so they can be ready to do any type of plumbing job. If the job requires to replace or install parts like faucets, drains or taps, you need to supply us with those. Occasionally, we can provide you with these, but keep in mind that the cost will be added later to your final bill. We deliver custom services to fit your needs. Have any thoughts about the service? Customer’s feedback is important to us as we strive to constantly improve and exceed your expectations. As part of the Fantastic Services brand, we have years of experience in providing property maintenance services. We aim to improve the environment of your home while saving you time and money. We offer 7-day booking availability. You can book your service or request a quote online by filling our booking form or by talking to one of our operators here in the live chat of our website or by calling them on the phone. We provide professional services at reasonable prices. You can request a free quote. Take advantage of the full range of services we provide. We can fix almost anything around your house. Combine the visit from your plumber with other home services and we'll send a whole team to your property to fix everything around your house in a day. Do you need to repair your squeaky floor? Or you need to repaint the window frames, or assemble a new wardrobe? We got you covered. Request a quote today and improve the value of your home!